This Hindenburg medal with Swords is an early brass strike. 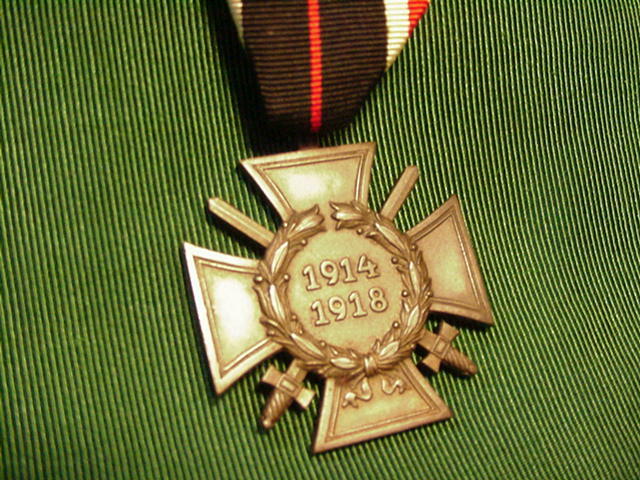 The medal has nice detail to the legs of the cross as well as the center wreath with the dates, “1914” and “1918”. A pair of crossed swords pierce the center. The reverse is marked "39 R. V. Pforzheim". This medal comes with the original ribbon, which remains in excellent condition. 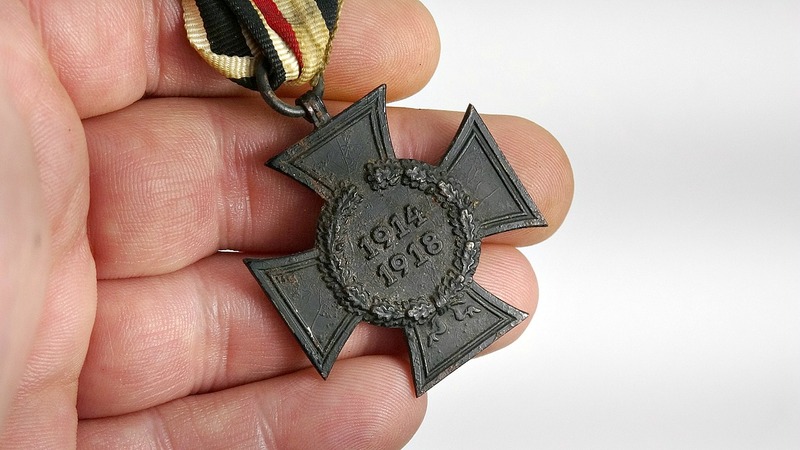 This Hindenburg Widow's Cross is finished in black, which was standard for this type of medal. This finish is totally intact. The reverse of the medal is marked "FVH". The original ribbon accompanies this cross, a white grosgrain affair with a red center and black edge stripes. Attached to the ribbon is a parade bar, although I am not sure exactly what kind. It looks to have always been with this piece. This Hindenburg Medal is a fine bronze strike. It is i excellent condition throughout. The reverse of the medal is marked "ST&L". The original ribbon is in the loop. It is of white grosgrain with a red center and black edge stripes. Attached to the ribbon is a Hindenburg parade bar, with crossed swords and the same pattern as the ribbon. This example is maker marked on the reverse, “H & Co. L.”. The attached ribbon is the style that was used for awarding to widows. This ribbon is a white satin color having a red center stripe with outside stripes of black. This Hindenburg Medal is a good strike to the Maltese style cross. The legs of the cross are outlined with a raised line and in the center there is a wreath of overlapping oak leaves. In the center are the dates, “1914, 1918”. These medals of course were given to participants of World War I. The reverse of the medal has the maker’s initials raised out, “CR”. The appropriate ribbon is on the loop being a faded red in the center with stripes of black, white and black running out on both sides. A good example. This Hindenburg medal is the typical Iron Cross depiction with swords running through and raised out wreath in the center. It has the dates 1914 through 1918. It is complete with its original ribbon. These medals were presented to all World War I Veterans.